There is something comforting about having breakfast foods for dinner. I’m not talking cold cereal, but anything that requires kitchen appliances and/or a spatula. 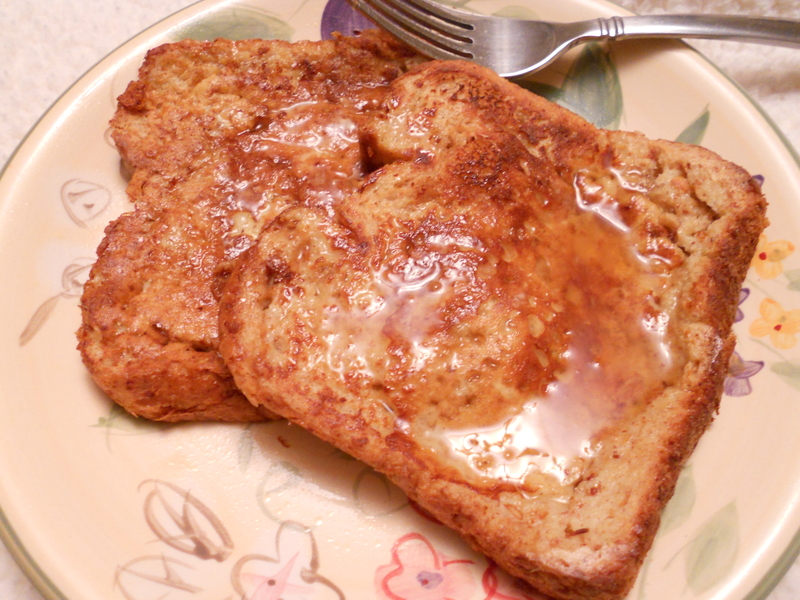 For instance, this delicious whole wheat french toast. The only thing that can increase the pleasure of such comfort is eating it in bed, which is exactly what I did tonight. I decided to unwind curled up in my favorite blanket, catch up on some DVR (Gossip Girl and Thintervention) while stuffing my face with this fabulous dinner–paired with chocolate milk of course. I may have mentioned in my first post that I just turned twenty-six. That was a typo. I’m really only six. News Flash: I am obsessive compulsive. I wouldn’t go so far as to throw the “D” in there, but I am definitely “OC-“, as I believe most human beings are, to a certain extent. I get so super excited about an idea or project (or anything! ); I’ll think about it constantly, draft lists or draw pictures, and daydream about it until I can put it into action of some sort. My parents told me I was OCD about certain foods growing up. I would eat ‘chip sandwiches’ non-stop for weeks at a time, get sick of them and move on to something even more weird that I would continue to consume for weeks at a time. What was I saying? Oh yea, I get obsessed. My current obsession (which I must say, has definitely come and gone over the past few years and has yet again made an entrance) is my desire to sew and create and design and just let those creative juices flow (…get your mind out of the gutter)! My bible for the next few weeks? Last night I stumbled upon DIY Style Blog and the subsequent 24 hours were spent debating whether or not to head over to Borders right after work and pick up the paperback copy that was listed as “Likely to be in the store”. I snagged the last copy. Ha. 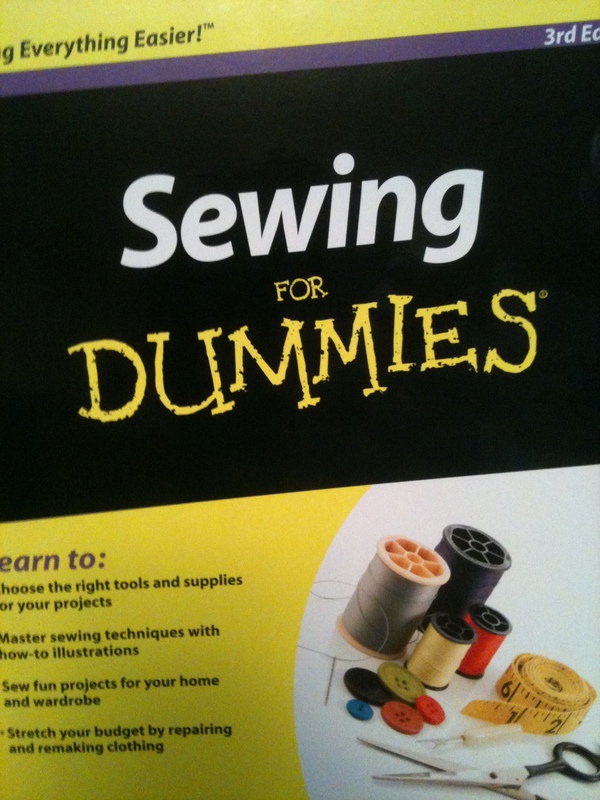 I’ve always been into sewing creating clothes. I used to use scraps from my mom’s projects to make clothes for my Barbies. These sophisticated doll clothes were all secured with Velcro. Each outfit consisted of a skirt and shift top, which was surprisingly secured in the back with… Velcro. Shocker! I was somewhere between the ages of 6-10 I am guessing, so cut me some slack. So, I’ve got my bible, a new semi-basic starter machine on it’s way, and a head swarming full of ideas. I told my dad of my plan to start sewing again and he asks if I want any of my 3 machines from the storage unit in Connecticut, to be shipped out to me in California. “No thanks, I think one is broken anyway,” I let slip out. My dad, who has already started selling, giving away, and hauling my stuff to the dump just to clear out space in the over-sized storage unit he had to purchase for me when I moved 3000 miles away, says “What are you doing holding on to them if they are broken? !”, I quickly change the subject and make a mental note to be sure to get rid of useless items hogging precious space during my visit home. Hmmmm…. Does Hoarders go to Connecticut? If so, we have unit C238 off of Route 5. I’m off to listen to my new KT Tunstall album on repeat (such a bad habit I have.. and another sign of the OC in me), delve into my new bible, and let out some of those ideas taking over every inch of free space in my mind. I had french toast for dinner the other night too for starters. Secondly, I believe in your efforts of explaining your O.C,you failed to say that you totally got me hooked on those damn chip sandwiches with dijonaise (sp?) for a while. Also, the fabric we scoffed up from your moms stash was priceless when we figured out we could make yarn dolls and try to sell them to poor old men and women in the neighborhood, sorry trudy. Now that i see your new passion has become your new obsession, i am pretty sure i will be putting in my orders soon to get fresh and fabulous amber designs in my new place!